This house / villa , with a land size of 482 m² (about 0,12 acres) contains 5 rooms including 2 bedrooms, 1 bathroom and 1 toilet. It is equipped with a living room. Others : fireplace. Easy Living in this Great Property Comfortable village house of 75sqm living space, in good general condition, with a full basement, located in a village of the Ternoise valley, between Hesdin and Anvin. It comprises of : fitted kitchen, living/dining room of 25sqm with possibility for fireplace, bathroom, wc, 2 bedrooms, garage, oil central heating, double glazing windows. Set on 618 sqm of land. Quiet Village Location Nice village house in good condition set in a quiet location 10mn from Hesdin and 60mn from Calais. The property is made up of: kitchen, back kitchen, 2 dining rooms, living room with french windows, bathroom, 2 bedrooms upstairs with one en suite, garage, nice 500m² garden, double glazing windows, oil central heating. A compact property. Garden of 463 m². Canche Valley Property In a charming and quiet village of the Canche Vallee between Hesdin and Frevent, pretty village house built on a nice plot of 516m² comprising : Lounge with wood burning stove, sitting room, furnished kitchen, bathroom, wc. shower room comprising shower, washbasin and separate toilet. Village Location Lovely views for that farmhouse recently renovated, situated on the edge of a nice pretty village near Fruges , 45 min\' from Calais. It comprises: Living-room with wood burning stove, furnished kitchen, 1 large bedroom and 2 small bedrooms, bathroom and wc, large loft for conversion, cellar. Set on 940m². New gas central heating, new septic tank. New insulation, New wiring, double glazed windows. This house / villa (country house) contains 7 rooms including 2 bedrooms, 1 bathroom and 1 toilet. It is equipped with a living room and with a garage. This house / villa (villa) , with a land size of 1000 m² (about 0,25 acres) has 9 rooms including 4 bedrooms, 1 bathroom and 2 toilets. It has a living room, dining room, a garage and a cellar. Others : fireplace. Situated just 2 miles to the sea side, near the baker, house with 5 mains rooms and fenced garden of 710 m². ON 1ST FLOOR : Landing, Bathroom comprising bath and washbasin 3 bedrooms of 10 m², 11 m² and 9 m². 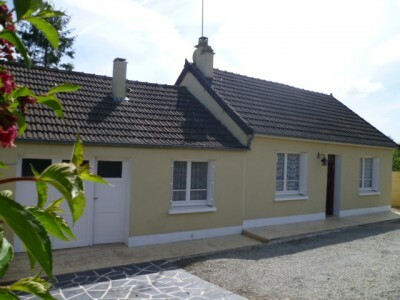 Situated just 5 mns drive to the town of La Haye du Puits, 3 bedroomed house with garage. Fenced garden of 550 m² with nice view on the country side. Independent WC, 2 bedrooms of 9 m² each. ON 1ST FLOOR : Bedroom, attic of about 14 m² to be converted and other rooms for storage. Stone built house on one level situated near all facilities. Large attic to be converted.Garden of about 800 m². Fitted kitchen of 11 m² with access to the terrace, living / dining room of 16 m²,bedroom of 16 m² (fireplace) fitted with cupboards, bathroom comprising double washbasins and corner bath,separate toilet, large attic could to be converted into 2 bedrooms and a shower room (water connexion and electricity in place), existing staircase.Gaz central heating, mains sewerage, electric shutters, new PVC windows. Large patio. An ideal 'Lock up and Leave' holiday home. In the country side, 6 kms drive to the town of Lessay, old farmhouse to restore with courtyard and garden of 2 000m². 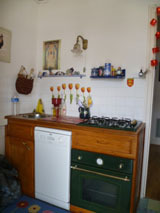 Kitchen of 22 m² with fireplace, living / dining room of 20 m², shower room comprising shower, washbasin and WC, bedroom of 15 m². Attic to be converted. Numerous outbuildings to be converted comprising old barns with large volume, stable and garage. No heating or septic tank. Apartment right on the sea side with views across to Jersey. Situated in the very popular resort of Barneville and ideal as a holiday letting property.